For there’s not a team like the Glasgow Rangers! No, not one, and there never shall be one! Earlier this summer, I traveled westward for a highly anticipated adventure. But before it can be entirely understood, some prerequisite background must be related. Two major forces collided for me as the calendar turned from 2006 to 2007. A few months before, in my occupation as a college professor, I began to identify globalization/internationalization of sport as a fertile area of research in sport business, my area of expertise. To understand it better, I supposed I must learn more about the sport and culture of soccer, which was barely on the sport radar as I grew up in southwest Mississippi during the 1980’s. I played it in physical education classes and enjoyed it greatly, but outside of that, I had very little connection to it. To investigate the globalization and soccer topics more, I secured several volumes of reading material. One of the books I selected was Franklin Foer’s How Soccer Explains The World: An Unlikely Theory Of Globalization, since its title seemed to kill two birds with one stone. At the same time, I received my first appointment to teach in Missouri State University’s joint international business program in Dalian, China. Having never been outside of the U.S. or Canada, this promised to be a trip of a lifetime. It did not disappoint on any level. One of the books I stuck in my bag to read during my China trip was Foer’s work. As it turned out, the book, which detailed an American’s perspective on how soccer was played in 10 locales around the globe, was more about how soccer explains the world than any sort of theory of globalization. Long story short, I found the book riveting, even amid the incredible experience I was having in China. I couldn’t put it down and finished it well before I even walked into a classroom to teach my first lesson in China, and I actually re-read it twice before arriving back in the U.S. After reading it and using my professional knowledge base on how to further learn about this phenomenal sport I’d just discovered, I knew immediately the next step would be to adopt a team to support. While the book featured some of the world’s most prominent soccer clubs and countries, the chapter that by far gripped me the most dealt with Scotland’s Old Firm rivalry between Glasgow’s Rangers and Celtic clubs, which basically is a cultural extension of the unfinished business of the Protestant Reformation in Great Britain (Celtic was founded as a Catholic recreational outlet, so Protestants thus rallied to Rangers, though it was not founded for that purpose). Given the gripping nature of that chapter, I knew I’d have no choice but to select an Old Firm team to support. As a non-Catholic, I only had one alternative, and I’ve never looked back. I can’t even begin explain the fervent love I’ve developed for Rangers since then. I’ve been a life-long sports fan and have bandwagoned with the best in every sport at one point or another. The closest level of team loyalty I can say ever approached my love for Rangers was (oddly) the Boston Celtics, but my love for the NBA has waned considerably in the past decade to the point where I barely pay attention to it. But I love Rangers. I love them. As difficult as it is to find it (and ship from overseas), I’ve horded a sizeable collection of Rangers gear, as well as a badge (pin) collection that numbers 145 (or so) and adorns my wall amid a print of Rangers’ Ibrox Stadium in 1960’s. A coffee cup with a picture of Queen Elizabeth in a blue dress doctored to look like a Rangers shirt sits on my desk at home. Though I’d never do it, their emblem is the only thing I’d ever consider for a tattoo. Like I said, I love Rangers. Obviously, as with any long-distance love, certain logistical problems exist. For one, since they’re not in a top-flight league, I can only watch them on television during European play (while their league recovers from the Setanta collapse and figures out how to package the games over the Internet). For another, many of their games are on Saturday mornings about 6 a.m. Springfield time, while the Sunday morning games often conflict with church; sleeping and services are non-negotiable for me. As mentioned before, still another involves finding Rangers gear, since they’ve the misfortune of using Umbro as a gear supplier and JJB as their retailer (long, sordid stories behind both of those calamities). So when I discovered that Rangers may be coming to North America on their 2010 summer friendly tour, and that they were likely to play Celtic in the first Old Firm match ever to be held outside the city of Glasgow, I was beside myself with anticipation even before hearing that the match would take place at Boston’s historic Fenway Park. Then some wisenheimer(s) at the Boston Globe contrived a poison-pen editorial about how poorly Rangers fans had behaved in Manchester during the 2008 UEFA Cup final (as if that didn’t occur anywhere else or with any other club’s fans in the entire world! ), and Rangers (rightfully) pulled the plug on it. I soon discovered, however, that although Rangers would take their summer tour to Australia, all was not lost! 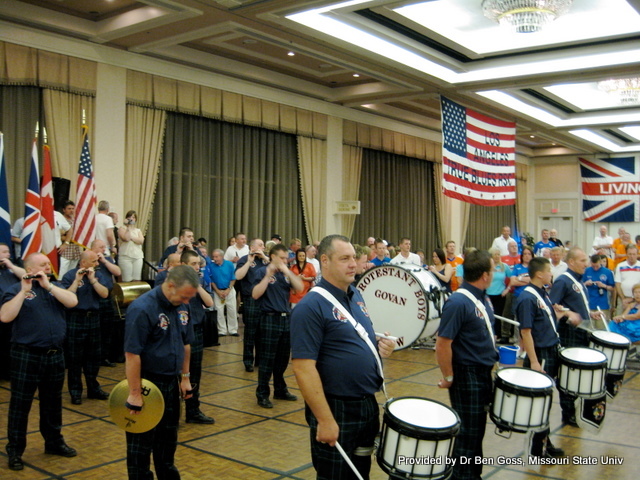 The North American Rangers Supporters Association (NARSA) was having its annual convention in June in the lovely city of Las Vegas. A few mouse-clicks revealed that, thanks to Allegiant Airlines, the trip was within my budget, so off I went, having secured tickets to the sold-out event through making nice to some of the NARSA brass (which involved telling them the spell-binding story you read earlier). No way! I read about him in Foer’s book! He was some character! WALTER?!?!? 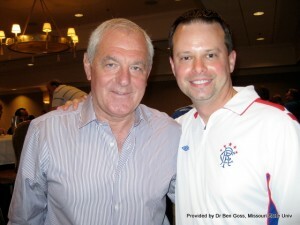 Rangers manager WALTER SMITH? The man who managed Rangers to seven consecutive Scottish Premier League titles in the 1990’s, then returned in 2007 to rescue Rangers and just led them to two-in-a-row-with-nae-dough (that’s two straight SPL titles with no money for player signings as Rangers stared down bankruptcy)? My brain was instantly on fire. 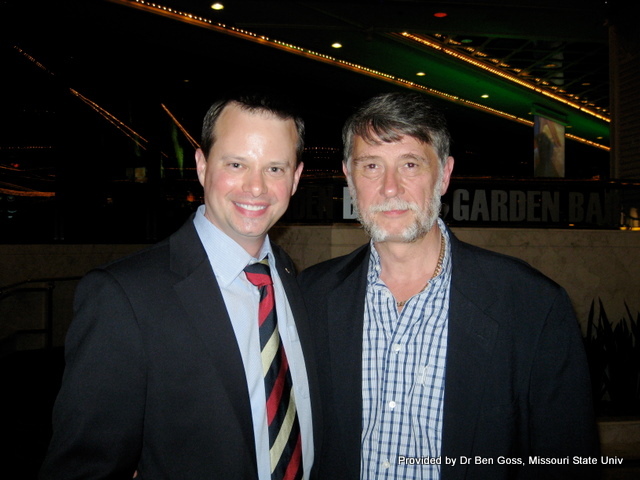 I didn’t know how I was going to sleep each night, and although I was in the right city for insomniacs, nothing except Rangers seemed to really matter, and I tried mightily to occupy myself throughout the following days until each evening’s event. The convention began the next evening with an informal reception. I didn’t know a soul, but I managed to make friends with the NARSA president (a good friend to have) who resides in Windsor, Ontario, but whose wife is from Columbia, Mo., hence their clan’s nickname, “Mizzou Loyal” (they later graciously presented me, previously a total stranger, with a gold-lettered black t-shirt proclaiming me, a Missouri State faculty member, as a Mizzou Loyalist). I passed a few words with a few of the couple of hundred people but was most amazed by the number of huge Rangers supporters clubs banners being hung by the hotel staff throughout the Flamingo’s gigantic ballroom. By the end of the evening, no wall space existed, as red, white, and blue banners from Orlando to Korea hung proudly all around. With my brain ablaze again, I managed to somehow occupy myself until the next evening’s “Blue Party,” which was attended by several hundred people and which could be best described as a Scottish equivalent of a college pep rally. The deejay played recordings of several Rangers songs, and within 20 minutes, the party was in full swing. The whole room chanted, sang, and whooped in unison, particularly to the many renderings of Tina Turner’s “Simply The Best,” an unofficial Rangers anthem, which many stood on their chairs to sing, with one gentleman also balancing a half-empty cup of the beer that fueled him on his head (remarkably, it took him about 30 minutes and five songs to spill it). I still knew almost no one but quickly befriended a couple who found their way to Vegas from Glasgow. While vacationing in Arizona, they said discovered that the NARSA convention was going on, so they’d hightailed it to Sin City and were enjoying themselves. As still a relative Rangers novice, I quizzed them about every aspect of the club I could, as well as picking their brains on travel tips, etc. They were all too happy to answer any question I had and seemed to enjoy my story of how I became a Rangers fan. Then the party really kicked off. A fife-and-drum corps from Scotland called the Govan Protestant Boys, whom I’d seen (and would continue to see) making merry at my hotel’s bar (the Imperial Palace, next door to the Flamingo), marched in, bagpipes blaring with “Follow, Follow,” Rangers’ primary anthem. Where the band was going was Las Vegas Boulevard! Down the escalator we went, through the main floor of the Flamingo’s casino, singing and chanting, spilling out onto the main drag before the police halted our progress at the mouth of the front door. We extended our pep rally at the main casino entrance for about another 15 minutes to the shock and awe of gamblers and passers-by. In the mass of humanity, I somehow got pushed into the edge of the band, and though I probably lost a few decibels of hearing, it was well worth the sacrifice to sing some of the songs I’d discovered over the previous three years. As the rally broke up sometime around midnight, I made my way back to my hotel, knowing I’d never make it to the board’s 11 a.m. business meeting without at least a few hours’ sleep. The Rangers brass, I found out, would attend that meeting, and I would not miss it. While the business meeting itself was interesting, I found myself wishing for a fast-forward button, and after an hour of patience, in walked Walter Smith, Martin Bain, Kenny McDowall, Jim Stewart, and Alistair Johnston, with Smith and Bain bearing the two trophies Rangers had captured in the past season. For an hour, as I sat almost too transfixed to snap pictures, they fielded questions from the audience, which included a couple of hundred die-hards. I can’t believe they’re here on this side of the pond, I kept thinking. Is this really the same group of guys I read about online and see in an occasional video clip? As the Q&A session broke up, I was unsure if asking for handshakes, pictures, and signatures would be appropriate, but as soon as I saw others doing it, I was on my way. That afternoon, I dashed across the street to the Hugo Boss store at Caesar’s Palace to grab a new suit I’d bought after realizing the one I’d brought simply wouldn’t do for the closing dinner (long story short: cheap fabric from China). In short order, I would be glad I did. But the real find of the evening was awaiting me at my table. Her name was Lara, a striking blonde Scottish lassie who was vacationing with her obviously well-to-do family and who was as unattached as she was beautiful. To prevent this writing from detouring in an unintended direction, I will summarize by saying that when I wasn’t pursuing pictures with Rangers brass after the formal program, I exchanged pleasantries with Lara and her family and friends well into the evening. They welcomed me like long-lost kin, and a good time was had by all. Though the crowd was much more subdued at the banquet than the previous evening, plenty of Rangers spirit was still evident when another drum-and-fife corps played Rangers songs before the meal. As the evening’s emcee, Donald Findlay did not disappoint. Though I couldn’t decipher 100% of what he said between the backup PA system and his Scottish brogue, he had the audience in stitches all evening, and it left me thinking that, controversial or not, in its recent hard financial times, our club could likely do with leadership like his again. After the program, which included speeches from club officers, Mr. Johnston, Mr. Bain, and Walter, I made my way to the podium to get pictures with the three aforementioned men, as well as McDowall and Amoruso. Again, just to stand next to them and pass a few words was a surreal thrill. In securing my picture with Mr. Bain (the general manager), no one was around to take it but Rangers chairman Mr. Johnston, who also serves as vice-chairman and member of the board of directors of International Management Group (IMG), the world’s leading international sports and entertainment agency. I was thus naturally reluctant to ask Mr. Johnston to do the honors, but he graciously did after Mr. Bain said he wouldn’t mind. Mr. Bain then returned the favor for me in my picture with Mr. Johnston, and I subsequently got a one-on-two audience with the two highest-ranking Rangers brass for the next few moments, the contents of which I can’t recall but which I’m sure were filled with basic psychobabble. Once more, Walter was all too happy to pose with me, and I laid it on thick but sincerely once again, because I wanted him to know how much I appreciated his achievements, his presence, and his service to Rangers, since the 2010-11 season would be his last. I returned to Lara and her friends and family, and we talked well into the wee hours amid the wailings of an absolutely horrid Tom Jones cover band before relocating to another part of the casino, where probably more than 100 Rangers fans had gathered and could be heard singing for quite some distance throughout the casino. As the wee hours wound on, Donald Findlay strolled through, and of course, I seized the opportunity to grab a picture with him. In my opinion, his expression clearly and accurately time-stamps the photo at 4 a.m.; for some reason, though, I don’t think my expression does. It may have been the two sips of Red Bull I had about 12 hours before (seriously, that’s all I had), but I rather doubt it. I think the cheese-eating grin was plastered on my face because I’d finally gotten to experience a bit of Rangers first-hand without a TV, computer, or book. As I bade the NARSA president and his wife farewell, he promised he’d secure some tickets for me if I wanted to go to Glasgow in the upcoming season. I plan to take him up on it. That’s the only way to top what happened in Vegas. Wonderful story. It almost makes me want to be a Rangers fan. But alas, my heart belongs to White Hart Lane and the Hot spur.